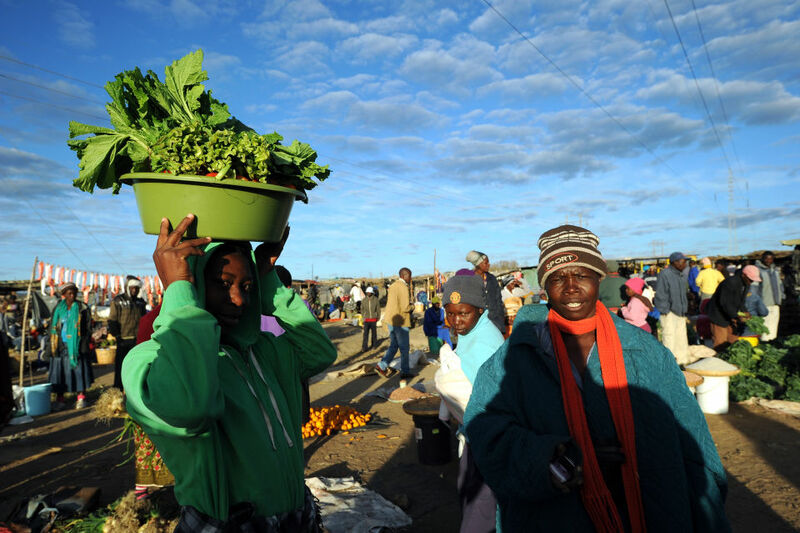 Zimbabwean women shop for vegetables in Jambanja market in Seke, south of Harare. A narrow dirt road snakes along the banks of a small river and leads to the remote village of Birirano. Marked by baobab trees and drought-tolerent shrubs, this small community is sandwiched between desolate mountains in Zimbabwe’s eastern district of Chipinge. Far from the main highway, it is largely cut off from the rest of the country and the world. With limited livelihood possibilities, villagers here have long been locked in an unending cycle of poverty. Over the past decade, their hardscrabble lives have grown even harder as lengthy and intensifying climate change-induced droughts have made rain-fed agriculture increasingly unsustainable, with crops repeatedly withering and dying. Then, over the last few years, the United States Agency for International Development stepped in and became synonymous with hope in Birirano, as the agency funded projects to build resilience against escalating global warming threats. USAID’s ENSURE program (Enhancing Nutrition, Stepping UP Resilience and Enterprise), for example, funded the construction of a weir dam that feeds water to new irrigation infrastructure, bringing the promise of a healthy harvest to thousands of local residents. While USAID provides the capital, a variety of non-governmental organizations pitch in to manage the actual work. In the case of Birirano, World Vision, a humanitarian non-profit, oversaw the project. “The Chipinge Rural District Council constructed an access road leading to the [new Birirano irrigation] project [while] other technical arms of government worked alongside World Vision [ENSURE] to monitor the work,” says Richard Ndou. The World Vision Zimbabwe deputy chief explains that the $55 million ENSURE program has significantly benefited six food-insecure districts in the drought-prone Bikita, Chivi, and Zaka districts in Masvingo province; and the Buhera, Chimanimani, and Chipinge districts in Manicaland province. Thanks to the program, more than 220 hectares are now under irrigation in the six districts with more than 4,200 small-scale farmers benefiting. Ndou noted how each new project seems to inspire the next. After former Manicaland Provincial Administrator Fungai Mbetsa visited the new irrigation project, the Birirano School was rehabilitated through the Schools Improvement Grant. Then the school was provided with electricity through the Rural Electrification Program. The Birirano success story is just one of many USAID-funded accomplishments. One villager, Amos Vhumbu, greatly troubled by his region’s recent recurrent droughts, is overjoyed by USAID’s contribution to his community: “This area is now very dry and this irrigation scheme is our only hope!” Vhumbu says. However, all of these new hopes have now been put into doubt by the election of President Donald Trump, and with the announcement that his administration plans to drastically slash funding to USAID as part of measures to reduce foreign aid spending. The USAID program to reduce the effects of climate change-induced drought in Zimbabwe was launched by the U.S. government in 2013 with $175 million in long- and short-term funding under the Development Food Assistance and Feed the Future programs. According to a summary report from the USAID mission in Zimbabwe, $55 million was earmarked for emergency assistance and $120 million for other food security activities over five years. Today, USAID-funded projects aimed at curbing the worst effects of climate change can be found across Zimbabwe, and those projects are currently benefiting more than a million people in food insecure rural areas. The $55 million ENSURE program alone is expected to benefit 300,000 people over a five-year period, providing them with new and rehabilitated dams, plus a variety of irrigation projects in the six targeted food-insecure districts of Masvingo and Manicaland provinces. A related program, dubbed Amalima, funded to the tune of $44 million, is running in four food insecure districts in Matabeleland North and South, also over five years. The dire need for U.S. foreign aid has been driven by two major factors: though Zimbabwe once had a vibrant agricultural sector, a double punch of bad government policies and worsening climate change-intensified droughts have seen a deep decline in farm production. The 2015 and 2016 agricultural seasons were especially hard hit by the onset of El Niño. That particular El Niño-driven African drought was driven by “one of the strongest El Nino events of the last 50 years,” which left more than four million people in the country in need of emergency food assistance. Climate scientists agree that the harshness of El Niño conditions experienced in Zimbabwe recently were exacerbated by climate change. “USAID helps rural Zimbabweans by addressing immediate food security needs, while gradually building resilience to climatic shocks,” reads part of the USAID Zimbabwe summary report. In addition to its climate resilence work, USAID is also promoting agricultural recovery and livelihood development under the Feed the Future program—aimed at reducing poverty in rural areas, raising incomes, and improving food security at the household level. According to USAID, the $8 million Feed the Future crop development program is covering 15 districts in Matabeleland North, Mashonaland West, Manicaland, Masvingo, and Midlands provinces, while the livestock program currently operates in 12 districts in Matabeleland North and South, Mashonaland East, Manicaland, Masvingo, and Midlands provinces. The crop development program, if not slashed by Trump, is expected to benefit more than 50,000 farmers, while the livestock development project would benefit 5,000 dairy and beef farmers over five years. Through the livestock program, thousands of dairy and beef cattle were served by the program and saved from last year’s drought. The USAID programs are building resilience to climate change shocks through more efficient water harvesting, and they have gained increasing support from Zambabwe’s government. The former administrator for Manicaland province, Fungai Mbetsa told journalists in the city of Mutare emphatically last year that projects to harness water for irrigation, such as those funded by USAID, are the solution to the lengthening droughts being experienced in the province. Many drought-stricken rural communities were hoping that their turn for much needed help would arrive soon, with new USAID-funded programs initiated in their regions. But those hopes were largely dashed with the release of Trump’s appropriately nicknamed “skinny budget” this spring. The worried question now on the minds of Zimbabwe’s rural poor: Will the Trump administration and the U.S. Congress—which has final say over the 2018 budget—slash some or all funding for aid projects in Zimbabwe? No one currently knows the answer. Some in the U.S. are strongly resisting Trump’s draconian budget proposals. Senator Ben Cardin, a Democrat on the Senate Foreign Relations Committee, for example, was quoted by Reuters recently, saying he was deeply disappointed and dismayed at Trump’s proposal to slash foreign aid spending. Unfortunately for Zimbabwe, the Democratic Party minority in the U.S. legislature has little deciding power at the moment. Shortly before Trump made his proposed cuts public last March, U.S. ambassador to Zimbabwe Harry Thomas Jr. told local media that he would reach out to the administration, urging it not to slash aid to the nation: “We are very proud that the U.S. government is the largest donor to Zimbabwe,” he said, “that we are giving $150 million each year to combat HIV/Aids, another $150 million to feed 2.1 million food insecure people … $10 million for democracy and governance….” The result of Thomas’ plea is unknown. U.S. Secretary of State Rex Tillerson is more outspoken. He was recently quoted by Reuters defending the proposed cuts as a needed correction to a “historically high” Department of State budget that had grown to address conflicts abroad in which the U.S. engages, along with disaster aid. Noting the massive contribution to disruptive climate change made by the U.S., and by Exxon, Tillerson’s past employer, some critics characterize the U.S. threats to cut aid to developing nations, especially for climate change resilience, as hypocritical and cruel. The 2018 U.S. budget must be approved by Congress by the beginning of October. Until then, doubt and confusion will likely reign in Zimbabwe and across the developing world. Absolutely! The Zimbabwean people themselves have not done themselves any favours queuing to beg from donors whilst doing nothing to stop Mugabe swindle billions of dollars a year from all the industrial scale looting going on in Marange and other places. The threat to cut foreign aid should help to focus Zimbabwean minds on the task before us – implementing the democratic reforms to ensure free, fair and credible elections. We need a good and competent government, at least one with some common sense, if we are ever going to get out of the mess this Zanu PF dictatorship has landed us into. Aid should have been cut years ago. That Aid pays for the mugabe family’s holidays to Singapore and his whore of a wife to shop to her hearts delight. And that money is spent on his little BRATS which are insulting South Africans everyday by wasting money and destroying everything they touch.